This takes water really well, better in my view than the much more expensive 20 and 23 year. 91 points for the 2012 bottling. 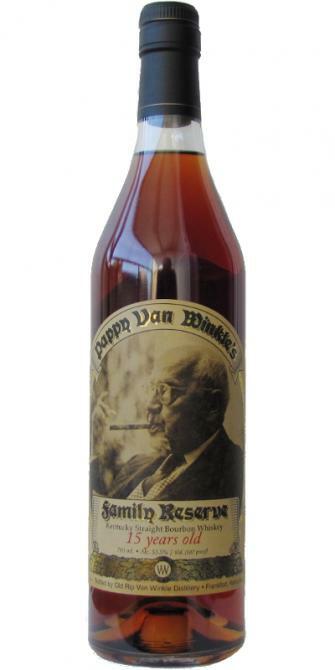 Other than the rye, Pappy 15 is year in year out the best of the 10/12/15/20/23/rye range. Waxed wood and solvent thoroughly! But also sweet and vanilla, more and more intense. It looks like an old grain! Caramel. Caressing and intense at the same time, never aggressive. Very attractive with some red fruits. It's a gourmet vanilla that comes first stage THEN the spicy attack second (This is one of the things that will mark me) The wood is present, but without bitterness too marked. Touch almost gooey. The spices dance a long time with a return of the solvent. The best van winkle of them all in my opinion,dangerously drinkable. bourbon. Not easy to find, though. Thanks, Kris! butterscotch, nutmeg. Dark fruit on syrup. The pecan nuts are of the roasted variety now. Wonderful. Coconut, varnish, creme brulee, caramel and some nuts. Powerful and rich. Varnish, salted butter caramel, bitter almond in the middle of the mouth. There are also a lot of spices and vanilla. Absolutely one of the best 15 yrs out there in my opinion. I have tried many this year and I still come back to this every time. The best place or opportunity to taste is at events, such as the WhiskeyFest here in the states. Each year all these whiskey`s come together and it`s a taste off!